Someone knocked on my door tonight to tell me there was a baby possum on the footpath in front of my house. I went outside and found a tiny baby ringtail possum crawling along the ground. I don’t know whether he’d fallen out of a tree, or off his mother’s back, but there he was, alone and vulnerable. There was no sign of the mother. But there are plenty of cats and dogs in my street, and if I’d left this poor little mite there, one would have got him. So I scooped him up. He was tiny, furry and very cute and looked so bewildered, poor little soul. 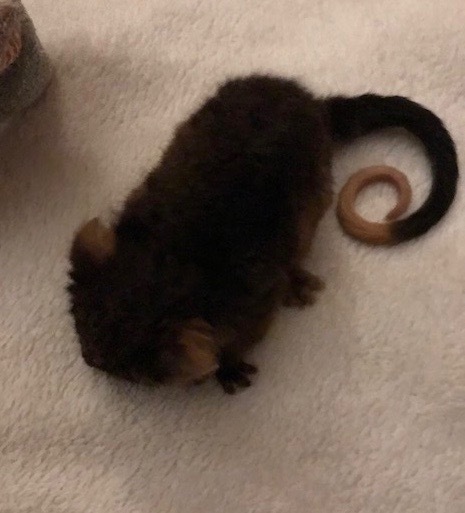 He was just big enough to sit in the palm of my hand, with a long curly tail hanging down. I wrapped him in a microfibre cleaning cloth and tucked him against my chest. He scrabbled himself up out of the cloth, just enough for his face to poke out. He put his little face against my skin and went to sleep. And of course, I was instantly in love. 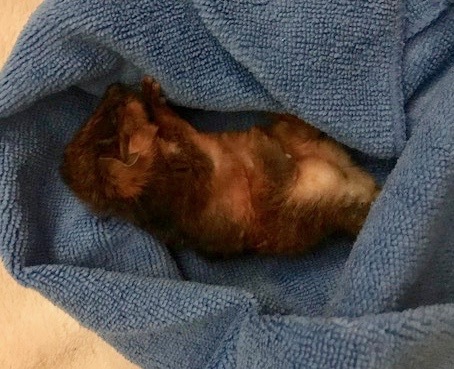 I looked for signs of the mother until it got too dark to see, then I phoned a wildlife rescue vet clinic, and made arrangements to take him in. I took a couple of photos but I was more worried about frightening or distressing him than taking a good photo, and besides, each time I put him down, he tried to climb back onto my hand. So my photos are pretty blurry. 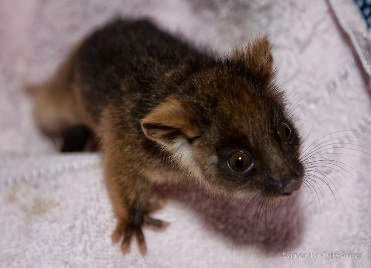 But the one below is someone else’s photo of a very similar looking baby ringtail. I was sad to hand him over, but he needs specialist care, and I know they’ll take good care of my little furry baby. I’m also feeling sad for the mother —if she’s alive — not knowing where her baby is. Life for wild creatures is tough.